TORONTO, ON – As reported last month, Steam Whistle Brewery will be hosting its annual Steam Whistle Oktoberfest on Saturday, September 21st as part of Toronto Beer Week, and they’ve kindly offered a pair of tickets be given away to a lucky CBN reader. To enter for your chance to win, leave a comment on this post describing your favourite Oktoberfest tradition. Be sure to enter your correct email address in the appropriate field – it will not be displayed publicly, but will be needed to contact you in the event that you are the winner. The winner will be chosen at random from all entries submitted by 12:00 noon on Friday, September 20th, and will be informed that afternoon. The winner’s name will be on the guest list at the event, which runs from 2:00 PM to 11:00 PM at the Steam Whistle Brewery (255 Bremner Blvd, Toronto). Please note that the winner and guest must be 19 years of age or older. Good luck! First and foremost, the tradition of indulging oneself in the joys of beer has to be my favourite, not just of Oktoberfest, but favourite tradition period. Oompa music, laderhosen etc. just round out the mix. The beer, the people….and the beer! My favorite part is hanging out having fun with friends while enjoying good beer. Eating sausages and drinking beer! Drinking beer with friends, of course! oops! I thought this was for the Vancouver Steam Whistle party at the Alpen Club. Please disregard my entry, thanks. The attire, the camaraderie, the steins and most importantly, the contents of the stein. PROST! Drinking beer out of a giant stein. Soft pretzels and mustard! (And beer of course!) Prost! Getting together with my Dad and having some great beers/German themed BBQ! Good times. 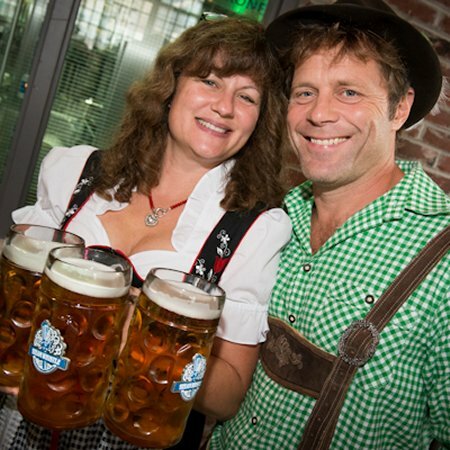 Well….my favourite Oktoberfest tradition is the Steam Whistle Oktoberfest party (of course)! Dusting off the lederhosen once again to enjoy a beer or two with good friends! It’s all about enjoying the beer at a great venue. I love Oktoberfest! I have been going to Oktoberfest events for more than a decade, including the real Oktoberfest in Munich in 2008! I would say my favourite part is the general happiness that surrounds the event….between the festive music, 1L mass steins of beer, and having strangers sit together and meet new people, it makes for an event where everybody smiles and can’t help but have a good time. The toasts are my most favorite tradition. There is nothing like hearing someone rambling along and everyone cheering afterwards no matter what they are babbling about.